The name DaTang was derived from the Chinese Dynasty called "Tang Dynasty". The Tang Dynasty is considered the Golden Age of ancient China. This dynasty marks one of the most prosperous Chinese eras, especially in literature and food. 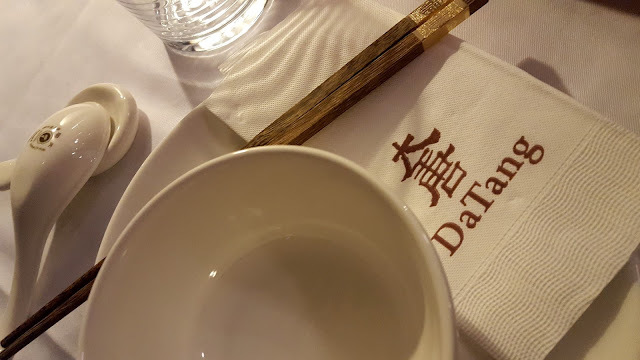 DaTang was formed by a partnership from Taiwan International Restaurant Chain Group, Alley's Cat and DaTang Express Inc. Inviting Taiwan multi-awarded chef Master William Liu, comes the first branch DaTang Jardin Asian Tapas Bar along Forbes Town Center in BGC, Taguig. DaTang Jardin was inspired from the diverse aroma, freshness and beauty of a garden. Pertaining to food, the dishes are served with guaranteed freshness, beautiful presentation and diverse flavors coming from 8 culinary traditions from 8 regions of China. Master Liu subvert the stereotype of traditional Chinese Cuisines into a much more stylish, exquisite, and authentic Chinese experience. Take a stroll into DaTang Jardin and enjoy the masterpiece. Last weekend I attended the grand opening of DaTang Jardin Asian Tapas Bar at Burgos Circle in BGC with fellow bloggers and foodies. There was a dragon dance and a culinary showcase by Chef William Liu. DaTang executive chef William Liu, is one of the most respected and well-known chefs in Taiwan. He specializes on modern Chinese cuisine, by re -engineering traditional Chinese dishes with Taiwan culinary creativity. The event was attended by people from the press, bloggers, friends and families of the owners and VIPs. Though I must say the event was a bit disorganized and to add to that it occasionally rained. There were a lot of attendees so we ended up sitting outside while it was raining but fortunately we got transferred inside. So we got to enjoy properly what DaTang Jardin has to offer. DaTang's menu consists of different kinds of Chinese cuisine and they have included some Filipino menu entries too. Which I think is great because our cuisine is widely influenced by Chinese cuisine too. The 8 Great Traditional Chinese Cuisine: Shandong - Even though this cuisine is not often seen, it is the most influential and oldest in Chinese culinary. Cantonese - Cantonese cuisine is considered the most dominant Chinese cuisines, due to its large immigrants throughout the world. It is also the dominant type of Chinese restaurants in the Philippines. Szechuan - Szechuan style cuisine is also one of the popular cuisines in Chinese culinary, most remembered due to its spiciness that could numb the lips and tongue. Hunan - Hunan Cuisine is also popular for its extensive spiciness and extra hot dishes. Fujian - originated from the Fujian Province in China, also known at Fookien / Fukien / Hokien. Zhejiang - This type of Chinese cuisine is considered mostly to be as food for the elite, mostly served to the nobles during ancient Chinese. 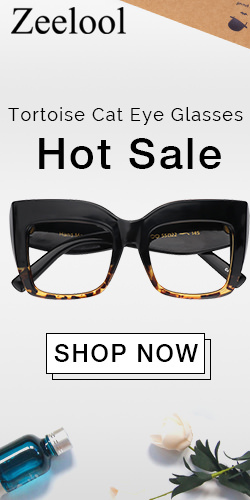 Known styles are: Shang-hai, Hangzhou, Ningbo, and Shaoxing. Jiangsu – This Chinese cuisine is considered to have the widest variety of cuisines, due to its several styles of cooking, it is also very popular today. Anhui - This is a native cuisine of the people of Huangshan Mountain region, due to the geographical conditions they mostly use locally grown herbs, vegetables and livestock. Griddle Cooked Shrimp with Garlic & Pepper - This was a simple shrimp dish grilled inside a clay pot which definitely stored the shrimps flavor and freshness. The size of the shrimps were good that you can still enjoy them to the fullest. Deep-Fried Shrimp & Purple Yam Served with Fresh Lettuce - I can’t tell where the taro was, but the size of the shrimps were good enough. I think the strings that were used to wrap the shrimps are vermicelli noodles then it was deep fried. That definitely added a lot of texture to this supposedly simple dish. As for the lettuce salad, it was ok and a bit sour. This is one of my favorites. Grilled Pork Neck Served with Garlic Sauce - This is my favorite of all the things that we got to try at DaTang. The meat is from the pork's neck which was super tender. It was so simple but was very tasty. Sweet & Sour Pork -These are meatballs on deep friend wanton wrappers. They taste ok and you must eat it with the wanton wrappers which added texture to this simple dish. Pan-Fried Sliced Scallops with Milk & Egg Whites in Truffle Sauce - These were truly luxurious especially with real truffles on top of the scallops. The scallops with egg and milk were tasty already and adding the truffles made it better. Dongpo Pork - This reminds me of pata tim, even the sauce tasted like it. The meat was tender but the cut had very thick fat and skin. Steamed Chicken with Chili Sauce - The chicken meat was well cooked and tender. I like that it was not super spicy and the sauce was very savory. Steamed Shrimp with Asparagus Served with Crab Egg Sauce - Just like the other soup that we tried, I also like this one. The soup was thick and packed full of flavor but it got only 4 pieces of shrimp and 2 asparagus stalk. Seafood & Vegetable Thick Soup - This soup is everything; it looks simple but tasted very flavorful. Filipinos love soup and can go only with soup and rice. Like what we say: "sabaw pa lang ulam na!" 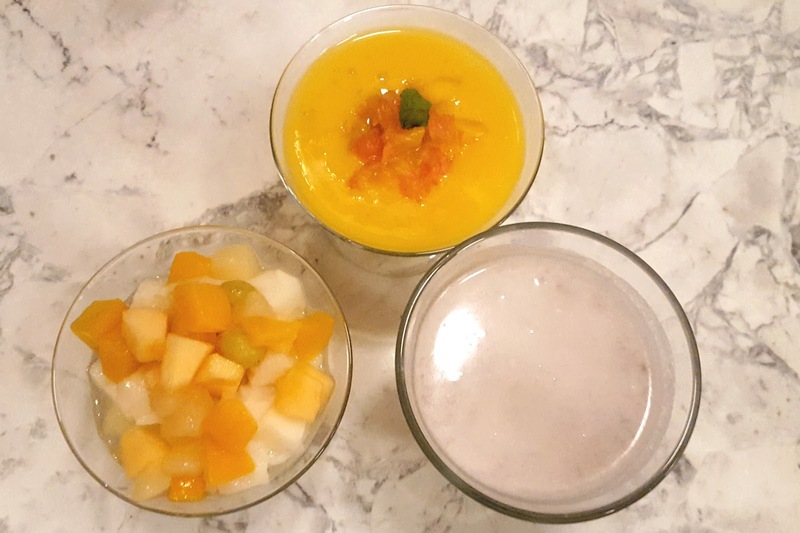 Almond & Tofu with Mixed Fruit, Mango, Pomelo & Sago Sweet Soup, Milk Taro with Sago - These are the only 3 desserts in their menu. Everything was great but surprisingly my favorite would have to be the taro. 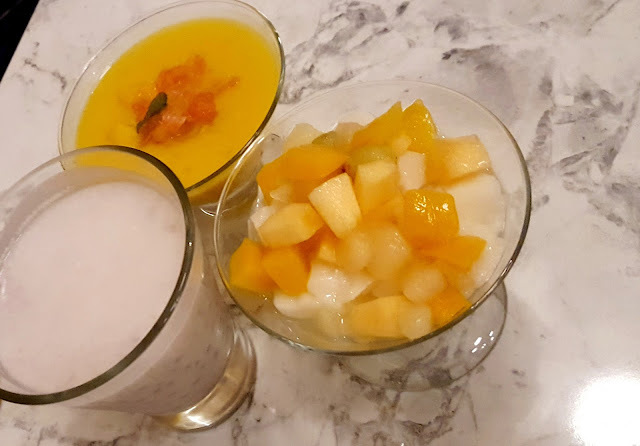 I am a huge fan of the mango and tapioca but this was just ok. The almond tofu was just so-so. The place occupied a small space but they have a loft area. The interiors are a bit odd but the hanging plants were very refreshing to the eyes. Service was a quite slow because there was a lot of guests during the opening; I hope that won't be the case in the future. The prices fall a bit on the pricier side, (well, it's Burgos Circle and it's BGC) and servings are good for only 1-2 persons. But all in all I pretty much enjoyed the dishes that we got to try and the company of fellow bloggers and foodies I was with that night.